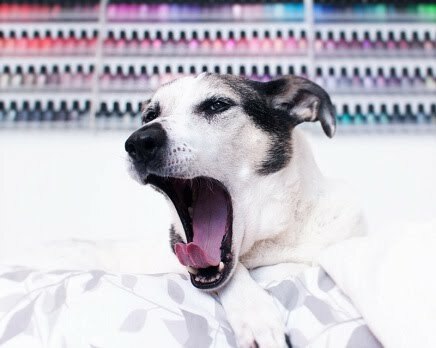 Polish Hound: Mail-time: Illamasqua Prismatic & Company! Hey everyone! Welcome to the weekend! I just wanted to get this quick mail-time post up, since I've already shown one of these polishes. I actually have a ton of photo sets/ posts in development at the moment, so I'm trying not to get behind! Anyway, this is the mail-time that I mentioned in the swatch for Illamasqua- Prismatic. I ordered these polishes directly from Illamasqua.com, something that is normally pretty price-prohibitive for me since I'm in the US and the special International shipping for polish is ridiculous. However, Illamasqua does give you a %15 discount on your entire order on your birthday, which almost entirely negated the shipping cost. So, this was a bit of an indulgent present to myself! Though I have to say that I still miss having easier access to Illamasqua in the US. This time, the polishes were shrink-wrapped into a secure polish brick. I also received a sample size of the Hydra Veil (moisturizing primer) with my order. I've tried a sample of Hydra Veil before, just once and not consistently, and I can't honestly say that it performs any different than a normal silicone-based primer. Maybe I need to use it more to form a better opinion, though? Look at Melange! I have wanted it since its release! Don't know when, but I'll definitely swatch it in the future. Strike and Shrapnel I had actually never heard of- I basically grabbed all of the polishes that I didn't already have in my Illamasqua collection. Strike actually has the old style circular sticker label on the bottom instead of printing on the back, so I'm not even sure when it was released (I think prior to 2009). Which of the others are you most interested in seeing swatches of? Wow! But how did you manage to order those from the illamasqua.com? I don't see these colours on the site except a Melange. Or have you bought them actually a while ago? Melange!!!! I've wanted it for SOOOOO long! Can't wait to see it on you! Jelous x 1000! Ahh love those neck flaps!! Trudy has a ton of extra neck too, and I love wiggling it (never was chubby as far as we know, just a saggy pibble). Saggy pibble FTW! At daycare my favorite dogs to squish are saggy skin dawgs or older puppies that still have loose skin! It's the best! I bet there are more accessible dupes! I will definitely take a look once my swatch sticks are organized, lol! And, I'm with you- Illamasqua makes my favorite formulas!